“Mama! Look! It’s a stop light. Do you see the red and the yellow and the green? Stop, slow down, go… I made them” We’re no strangers to open-ended and play-based learning around here, but I have to admit that, despite the materials I already have, I have been eyeing the Spielgaben set of wooden toys for years. Have you, like me, been eyeing this for ages? Read on for more about how we’re using it, what we love about it, and to learn about a special offer just for RLL readers — or go check out the offer right now, and come back to finish reading. 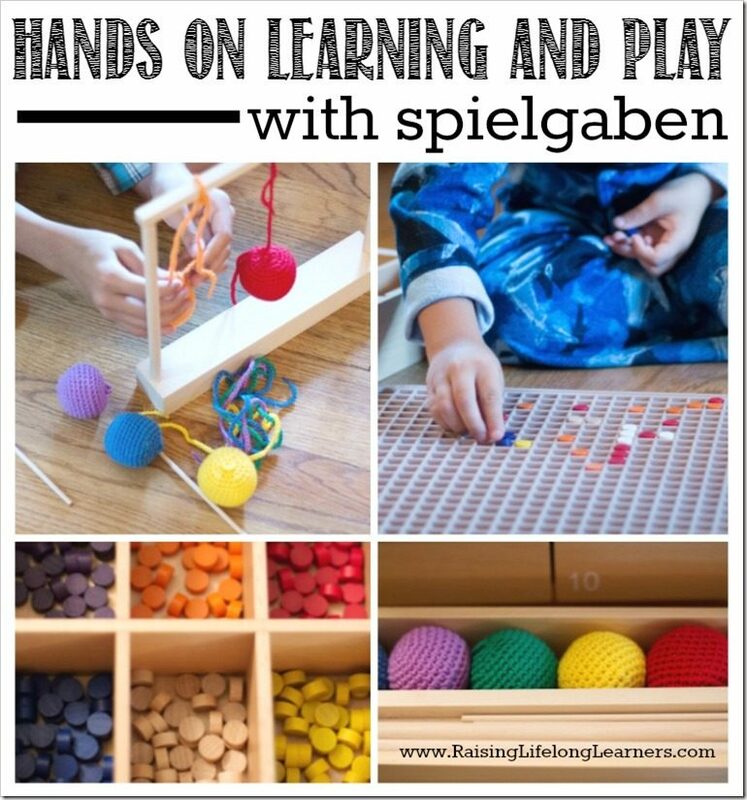 Spielgaben is gorgeous and packaged in a wooden drawer unit with hundreds of loose parts for free and guided play. My kids dove right in when I first opened the packages and started putting the pieces in their drawers. 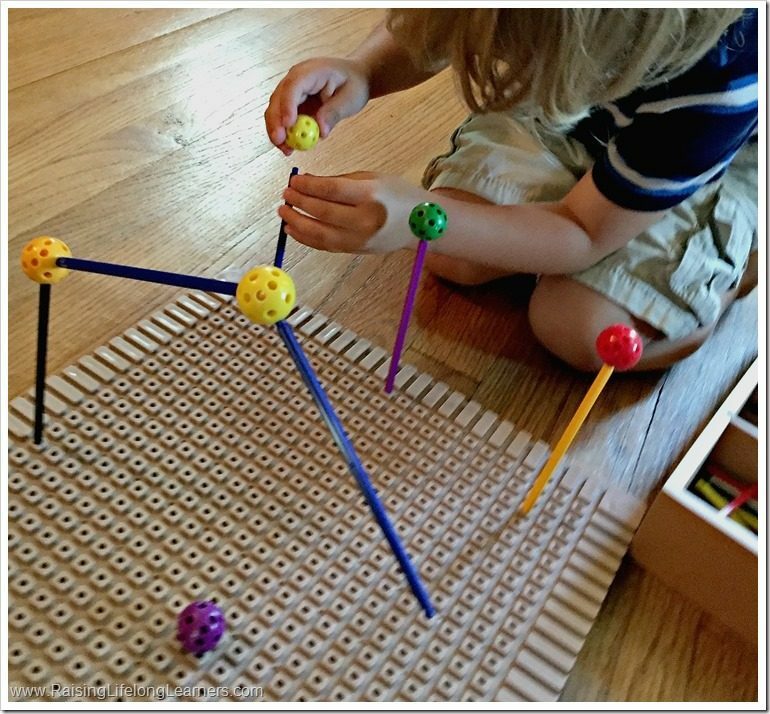 My three year old immediately put dimpled balls on top of sticks in the pegboard, letting me know that he was making stoplights. 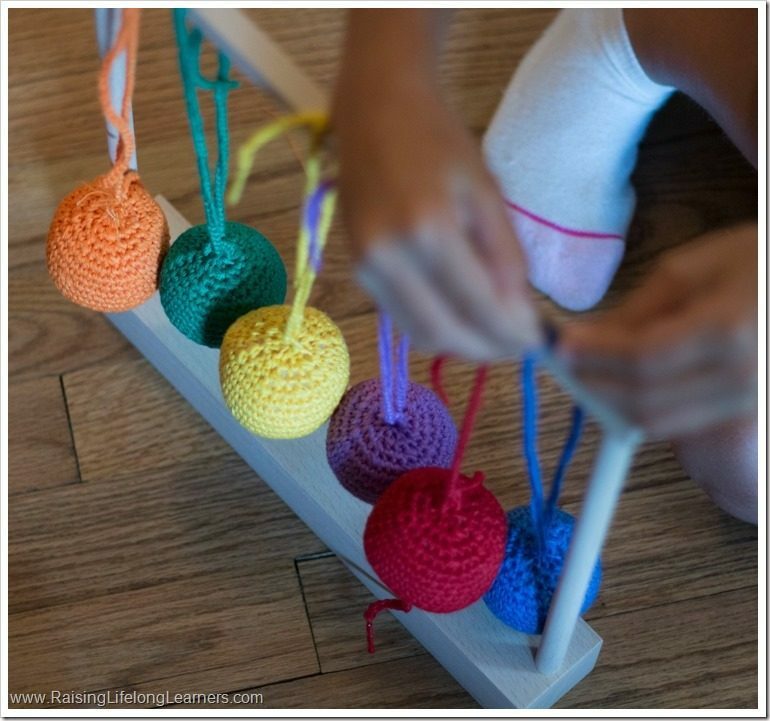 My six year old went for the woolen balls and tried to make a Newton’s Cradle by stringing the woolen balls with the included yarn. I just enjoyed the engagement. The Spielgaben set is developed based on the Froebel Gifts, a set of play materials for young children developed by Friedrich Froebel, an educator credited with acknowledging that very young children are capable of learning, and learning well – and that they have unique needs and capabilities. He created the first kindergarten in the early 1800s in Germany, though his school was a play-based school for what we’d consider preschool-age children today. This modern take on the classic Gifts is a gorgeous collection of 13 sequential sets designed to be used with kids during the crucial early years of brain development. As these are the same types of German toys that would have inspired great thinkers like Albert Einstein, Buckminster Fuller, Charles Eames, Frank Lloyd Wright, Paul Klee and Piet Mondrian, they’re worth looking into. And, I don’t know about you, but I love classic, brain-building, open-ended playthings that allow kids to take the reins of their own education imaginatively and early on. Young gifted kids would find so much scope for learning, discovery, exploration, and play in this set. And I know that my kids agree, as they’ve played with these every single day since they’ve arrived. Right now, since we’re still taking it a bit easy for summer, I’m just letting them explore the sets as they see fit. One of the greatest lessons from my classroom teaching days was that if you let kiddos explore new learning materials freely in play for awhile, they’re ready to use them to learn later on. For whom is Spielgaben designed? The Spielgaben set is created for children ages three to twelve, though I can see older kids using it, too. In fact, I plan to use this to help my oldest (almost 14 years old) with some of the more complex mathematical formulas and functions he’ll be experiencing this year. He’s also my more kinesthetic child, and I see him already pulling the toys out to fidget with and build on. For younger kids, though, the set comes with digital learning guides that are amazingly comprehensive. 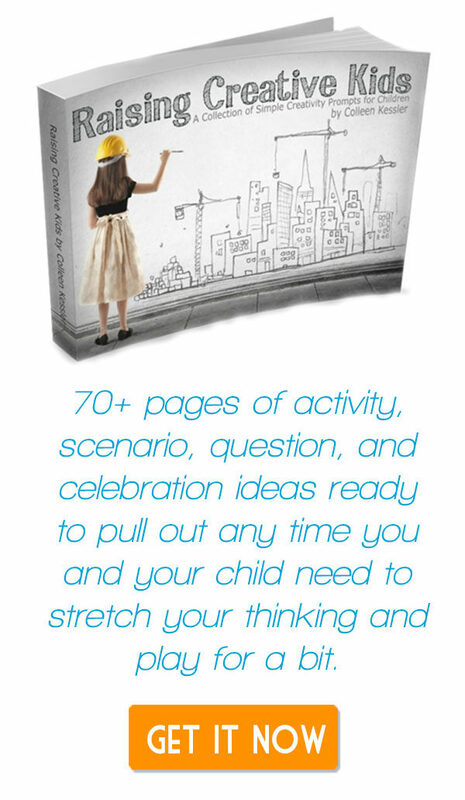 Give yourself time to sit down and read through them when you first get this, as you might not need anything else to have a robust and rigorous – and engagingly playful – kindergarten and early elementary curriculum for your kiddos. deepen their understanding of math concepts through the use of various shapes and solids. They’ll manipulate objects, compare, order, and pattern them, as well. build creativity by exploring the unlimited possibilities for use. They can experiment with line, color, form and perspective through play, eventually transferring this to their artwork and creative storytelling. develop problem-solving skills through the guided activities in the play and lesson manuals and prompt cards, as well as through kids’ own open-ended play. Deciding which materials to use, how to use them, and creating worlds and stories to go along with them uses many of the same skills that build great problem solvers. develop logical thinking skills by beginning with seemingly random play, and graduating to more advanced and pre-planned play. 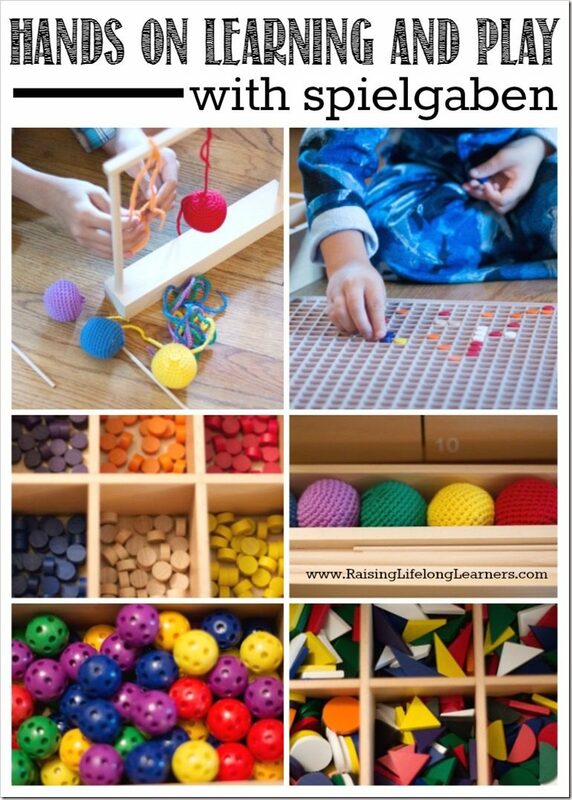 Kids will approach their use of Spielgaben, as they get more confident with the materials, with purpose and planning. They’ll come to the table with ideas, and figure out, using problem solving and logical thinking, how to carry out their plans. will deepen their language skills as they use increasingly more descriptive words to tell about their creations. Is Spielgaben worth the cost? The short answer is, yes. Spielgaben, in my opinion is totally worth the investment if you and your child love open-ended, play-based learning that focuses on creativity and problem solving. And is IS an investment. 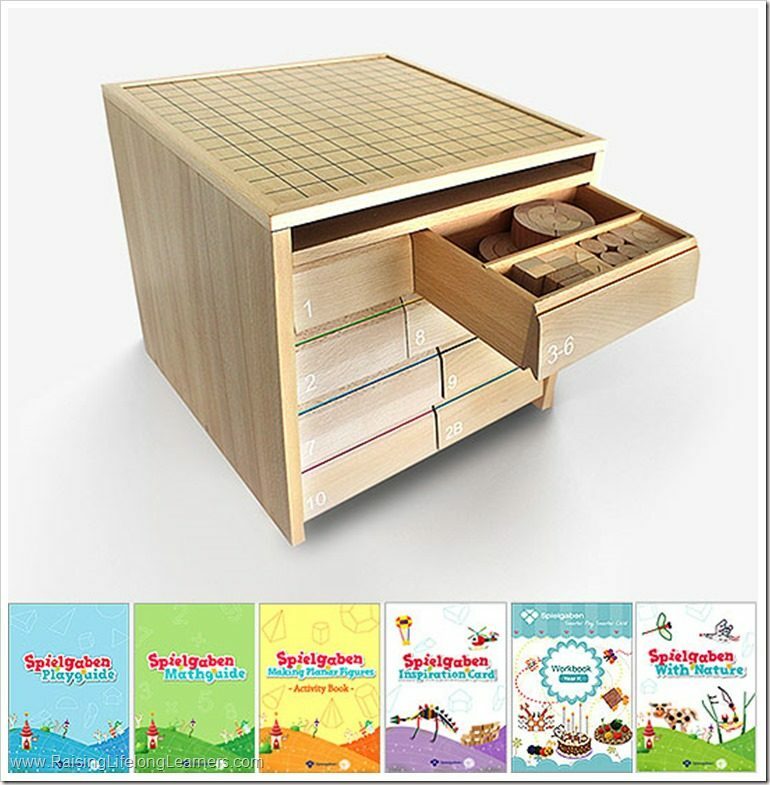 14 sequential Spielgaben sets made of environmentally sustainable and non-toxic child friendly materials, all stored in solid wooden storage drawers with 8 individual storage containers. Set one is a collection of soft, easy to hold woolen balls with removable strings, allowing kids to evaluate different types of movement. The balls are the colors of the rainbow, and include a crossbeam, crossbar, and pillars. Set two (A and B) contains twelve solid geometrical figures to help your kiddos understand the core basics of mathematical figures and shapes. Part B takes this further by adding colored solids. Most of the solids in 2B have holes in the middle. The addition of colors and holes give kids even more options for building – a cylinder can be rotated like a wheel, but a cylinder with a hole in it allows an introduction to the axle. Sets three through six provide more complex tools such as cubes, cuboids, triangular prisms, semi-circular columns, concave parts, and concentric rings to make shapes and teach the relationship between a whole and its parts. Kids can use these to explore how different geometric solids work together to create structures. Set seven is made up of seven differently shaped flat pieces – colorful squares, equilateral triangles, right angle isosceles triangles, scalene triangles, obtuse isosceles triangles, circles, and half circles. With these, kids can discover the relationships between geometric figures, 3D and 2D shapes, and practice problem solving, patterning, and rotation. Set eight (A and B) help move kids from planes to lines using sticks of different lengths. They’ll be able to explore measurement and then can add the vertex balls in 8B to learn how abstract ideas can be created in real form. Set nine includes a collection of rings and semi-rings. 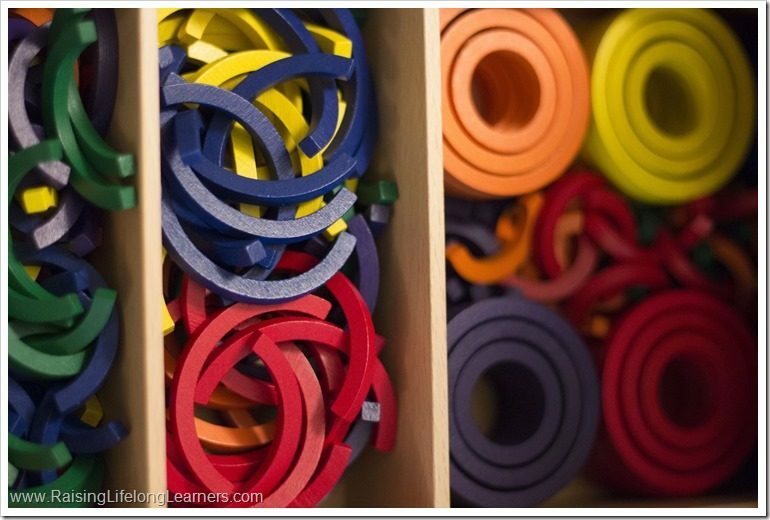 The rings come in multiple sizes, so kids can choose from small, medium, or large rings in a variety of colors. Kids will love exploring shapes and patterns while they learn about spherical geometry. Set ten involves one of the most critical elements of geometry: the point, making it tactile and kinesthetic. Kids can put them between line segments, demonstrating how a point allows a line to change direction. 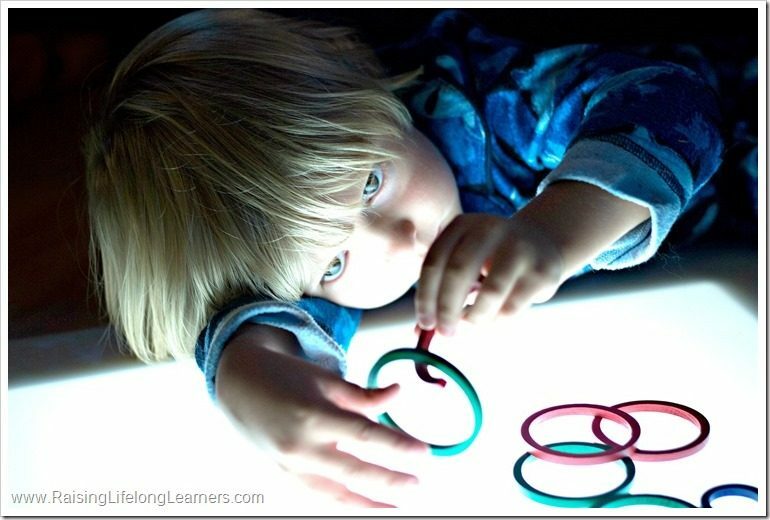 They can use them as counting aids, to play games, to create borders or to learn patterning and sequencing. The tiny pieces will also strengthen fine motor skills. 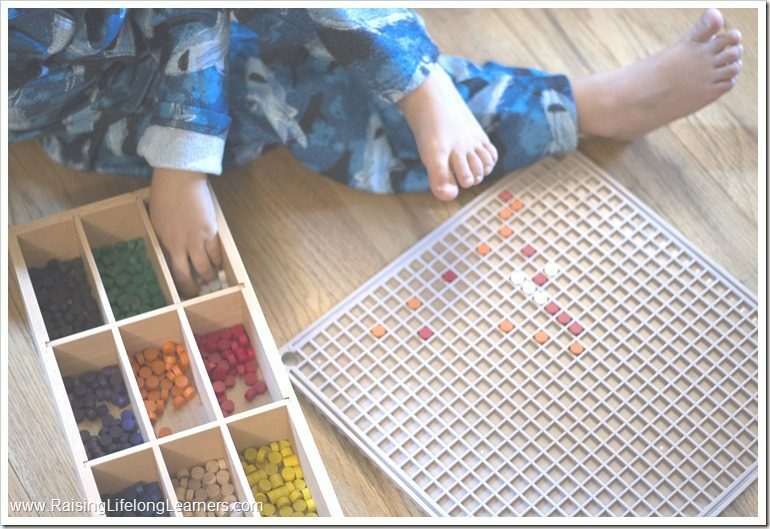 Playboard one is made of solid European Beech and each grid is a one-inch square to provide a child the sense of distance and size. 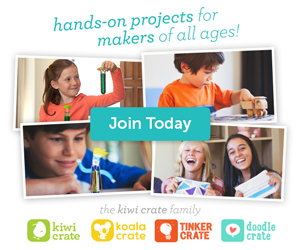 This playboard will provide a solid base for whatever kids want to create. Playboard two is a dual-sided, high quality plastic board. 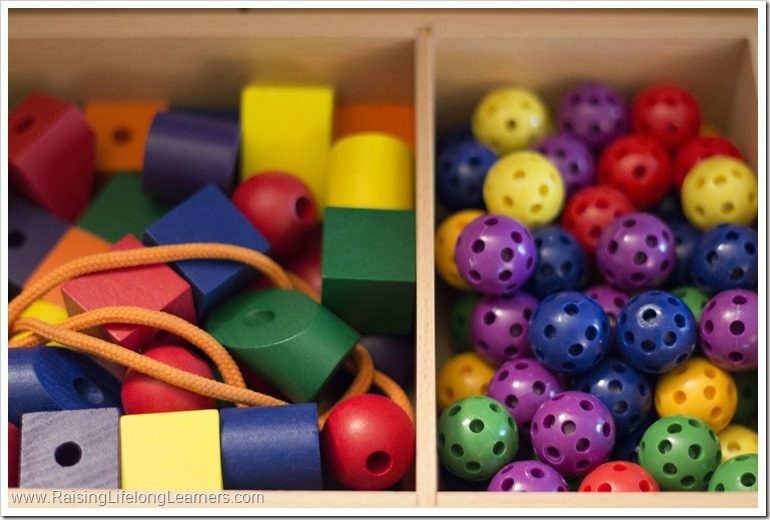 One side allows kids to play and create with their points, and the other allows for play and exploration with tablets, sticks, rings, and blocks. The materials are fantastic, and some would argue that they’re easy to find elsewhere. 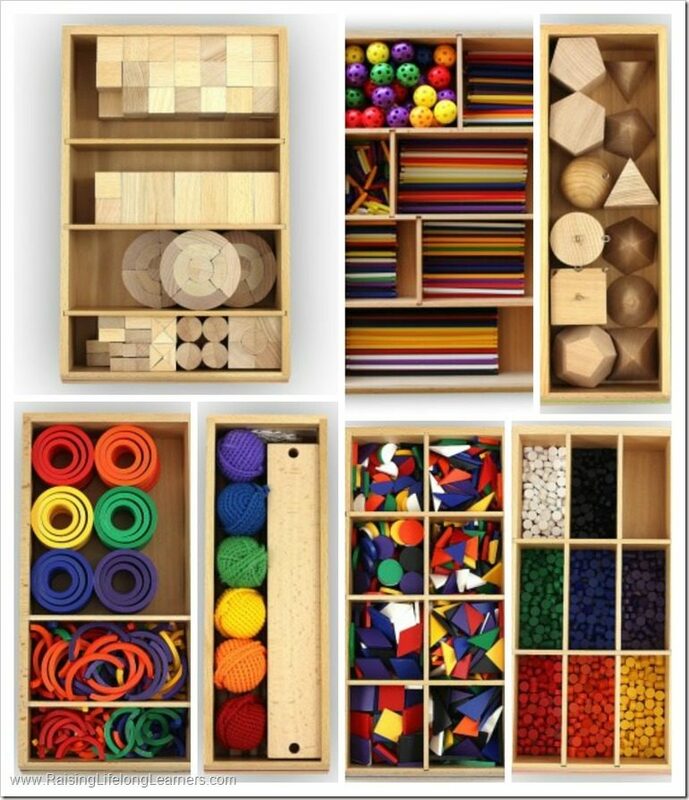 The quality is superb, the storage drawers are amazing, but the learning resources are invaluable, and not something you can get anywhere else. 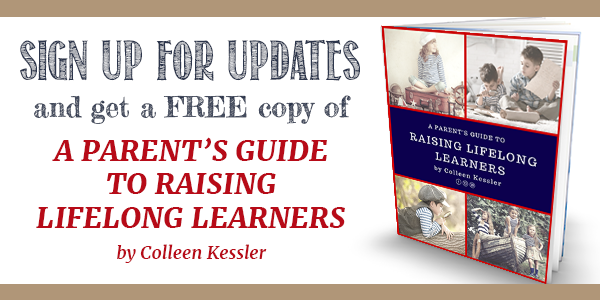 There are over 670 pages worth of learning activities and lessons that come in a full-color digital PDF format. If you’re like me, and prefer a hard copy without the hassle of printing the materials out, you can add on a print copy of the curriculum. You can find out more about the curriculum on their site, and I’ve included some samples below. Here’s the thing… Spielgaben is going to cost a significant amount of money, and will be an investment you’ll have to consider carefully. It’s $449, and can be shipped currently to the US, UK, and Australia. When comparing Spielgaben to other full curriculum packages for Kindergarteners, the price is comparable – if you’re thinking about it in that regard. The beauty of it, though, is that you can use this set as a full preschool through Kindergarten curriculum, and then as a supplement to all other years of curriculum as it will last for generations. I plan to use it with my super-smart three year old in the 2016-2017 school year as his main curriculum. My first grader will be using it heavily, and her fourth grade sister will be diving in as well. Even my middle schooler will find ways to incorporate this set into his learning in the coming year. 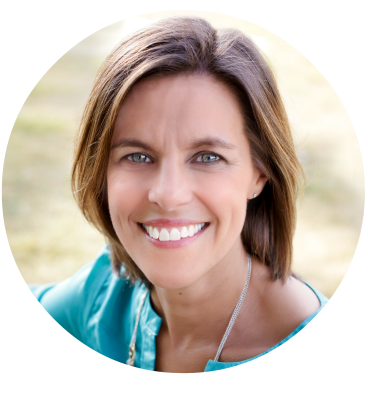 My biggest regret, actually, is that I didn’t listen to my gut and invest in it when I first started homeschooling. I’ve thought about it at the start of each year, and should have just done it. It’s the way we all love to learn, anyway, and would have been used day in and day out as it is now. Over the next few months, I’ll be sharing how were using our new Spielgaben set across my different ages, particularly focusing on how it can be used with asynchronous kiddos. 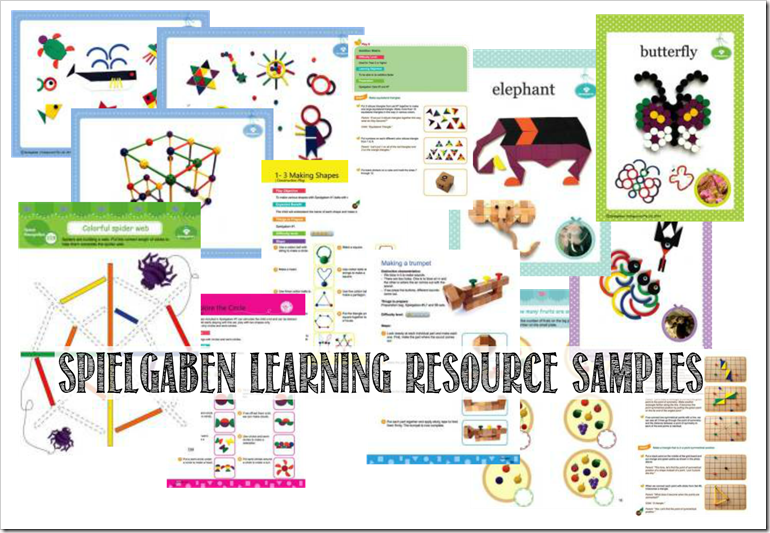 In the meantime, the amazing folks at Spielgaben have offered Raising Lifelong Learners readers an exclusive discount now through August 30th. If you want to follow along and complete the activities I’ll be creating for my middle schooler and all the things I’m going to plan for my littles, now is the time to invest. Simply click over and fill out the interest form so the customer care team at Spielgaben can help you determine what would best suit your needs. They’ll let you know more about the deal, but depending on what you choose to order, you can earn significant savings on both the complete set and the printed materials. I was provided with a Spielgaben set to review, but as always, all expressed opinions are mine and true — and I’m so thrilled to be able to continue sharing with you how we’ll be using this set. I love, love, love it.